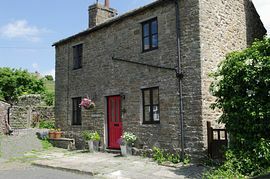 School House is a traditional, detached, stone-built cottage located on Mill Lane, a quiet cul-de-sac, which leaves the west side of the village, facing down towards the picturesque beauty spot of Mill Gill. The kitchen, bathroom and lounge have been tastefully modernised, but the cottage still retains rural features such as the raised open hearth and the stone flagged staircase. A small reception hallway leads to the base of these stairs and has doors to the lounge and kitchen. Through the kitchen is an under stair utility store with a door to the rear of the cottage. A stone-flagged patio garden gives ample space for outdoor eating and relaxation. Off the patio is a fuel store and the side entrance to Mill Lane. Upstairs there are two bedrooms, one with a double bed, the other with two singles. Each have built in wardrobes. The bathroom has a combined shower-bath suite with toilet and washbasin. School House offers good quality accommodation in a tranquil setting with nearby pubs, restaurants, convenience store and church of this popular and historic village. Located on a quiet cul-de-sac, open fire. 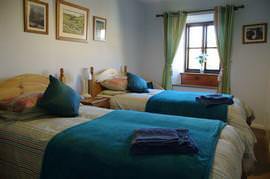 Duvets and pillows are provided and linen and towels included in the rent of the cottage. Two small well behaved dogs allowed, £10 extra for second dog. Local Services: Shops, pub, restaurant 200 yards. Bus route 100 yards. Precise directions to the cottage will given at time of booking. 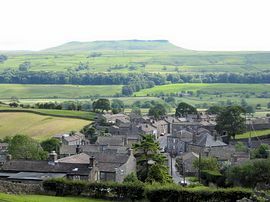 The nearest train station is at Garsdale. Prices are from £301.00 Low Season to £533.00 High Season. Mrs Faulkner wrote "The glowing open fire to welcome us on arrival after our journey. School House is a home from home with everything we needed for a relaxing stress free holiday. Thank you." 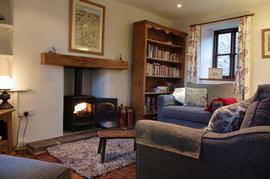 Mrs Wright wrote "Stayed last year and would again - lovely cottage." Mr Roe wrote "A great location for walking to waterfalls. Had a brilliant holiday. 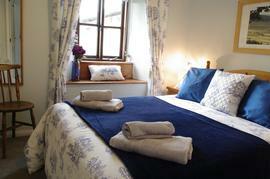 The cottage was well equipped with everything you need."